The parish of Saint Philip takes up the south-eastern nub of the island of Antigua. Its capital is Carlisle. Road access to it still needs improvement, but the isolation and naturalness of Half Moon Bay make it an ideal location for both travel and private living options. Lands surrounding the bay have been developed for residential purposes. Prime properties here take full advantage of the tropical breezes through strategic architectural plans, and capture impressive views of the white sand beach and curving bay. Considered one of Antigua’s most picturesque beaches, Half Moon Bay is undisturbed on workdays and comes alive during weekends, with both locals and visitors choosing to go swimming and windsurfing here. Its reef system is a good snorkelling spot and breaks the rough Atlantic waves, making the bay ideal for bodysurfing as well. However, facing the Atlantic Ocean has its downside. Hurricanes that pass through or near the island hit this side with extra force. In 1995 Hurricane Luis washed away homes, hospitals, and hotels, including the one on Half Moon Bay. The parish of NonSuch Bay not only hosts sailing events and provides anchorage to boats and yachts, but also offers high-quality modern living in exclusive settings along the small coves of Clover Leaf Bay, Browns Bay, and Hughes Bay, and around Ayres Creek. The hills are an idyllic backdrop for the parish’s waterfront villas and their private pools, beach cottages, and spacious apartments. Cleverly planned and positioned, both inland and coastal residences enjoy an open view of the bay and the large reef system that harbours it. Each property also benefits from the fresh sea breezes from the beach. 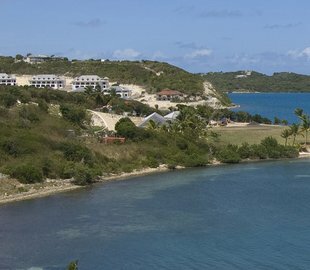 Residential architecture on Nonsuch Bay displays the Georgian colonial style, incorporating Antigua’s past with the dreams and demands of current high-end living. Those who opt for more privacy, individuality, and larger properties can purchase hillside lots. Exclusive residential properties and several commercial establishments line the coast of Long Bay Beach, which is known for its shallow waters and beautiful barrier reef. Close by is Indian Town Creek and its arching Devil’s Bridge, created by millennia of surf action on the cove’s limestone. Long Bay is a mere half an hour away from St. John’s. In the nearby villages of Willikies and Glanvilles, homes are rented or bought outright by people who love the area’s water sports opportunities and laid-back atmosphere. 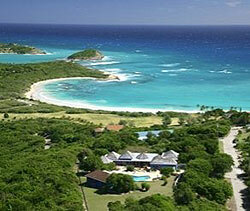 Convenient and rarely crowded, Long Bay offers purchase opportunities of hilltop and seafront villas.